Homegrown Minneapolis Food Council (application review will start afterOct. 2). Minneapolis Advisory Committee on Aging. Minneapolis Commission on Civil Rights. Minneapolis Police Conduct Oversight Commission. Minneapolis Police Conduct Review Panel. Minneapolis Public Housing Authority Board. Visit the City’s website for a list of appointment opportunities, position descriptions and the applications. The City of Minneapolis has more than 50 volunteer-based boards, commissions and advisory committees that advise the City on issues and help with policy development and administration of services. Boards and commissions fall into a handful of categories: appeal boards, development boards, general advisory boards, and special service districts, which are defined areas within the city where special services are rendered. Appointments to board and commissions are made twice a year — in the spring and fall. This streamlined appointment process makes it easier for folks to learn about volunteer opportunities, ensures a more open and understandable process for residents and staff, and increases the diversity of the applicant pool. The review and comment period for the Blueprint for Equitable Engagement closed on August 14th. All public comments that were submitted during the 45 day review period are currently being reviewed and documented. Neighborhood and Community Relations staff and a member of the Neighborhood and Community Engagement Commission (NCEC) will be redrafting the Blueprint for Equitable Engagement document based on comments and input received. Another public comment period will be opened later this fall for additional input on the redrafted document. 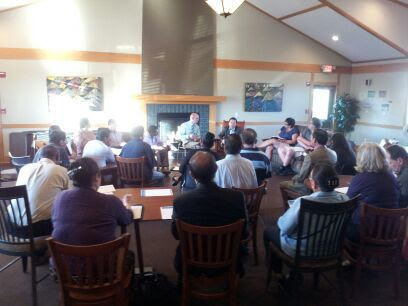 Thank you to every resident who participated in an information session and or provided input. To learn more about the Blueprint for Equitable Engagement, please visit:http://www.minneapolismn.gov/ncr/initiatives/EquitableEngagement. Abdirashid Ahmed, East African Community Specialist for the NCR department participated in a panel discussion at the American Swedish Institute on September 2nd that compared and contrasted the experience of Somalis in Sweden and the United States. Abdirashid joined Swedish scholars Dr. Benny Carlson and Dr. Tobias Schölin (Lund University) and Nasibu Sareva, Executive Director of the African Development Center of Minnesota (ADC) to discusscontemporary integration of immigrants in their new countries. Dr. Carlson and Schölin recently led a study that compared integration policies, with a focus on mainstreaming versus targeted measures (including training programs for specific ethnic minority populations), in eight countries (including the U.S. and Sweden). While Sweden often ranks globally at the top and the U.S. at the bottom regarding policies for mainstreaming immigrants, Carlson and Schölin found that the opposite can also be true when comparing actual results. Abdirashid spoke on behalf of his work with the East African Community in Minneapolis and finds that Somalis are integrating well, have their own shopping malls, restaurants, grocery stores, gas stations, transportation companies, real estate, money transfer businesses (local banks), charter and private schools, and mosques. Their involvement in politics is also increasing. To learn more about the work of Abdirashid and the Access and Outreach Team, please visit: http://www.minneapolismn.gov/ncr/outreach/WCMS1P-143464. The City of Minneapolis was recently featured in the Government Alliance on Race and Equity’s national blog on race and equity in local governments. The NCR department and Nexus Community Partners co-wrote an article on the Boards and Commissions Leadership Institute (BCLI) program, a 7-month leadership program that supports, trains and places people of color and other underrepresented community members on city and county publicly appointed boards and commissions. This is one aspect of a larger strategy to build diversity and equity into the City’s engagement work. NCR works closely with Nexus Community Partners to ensure that graduates of the BCLI are aware of the opportunities on Minneapolis’ boards and commissions. 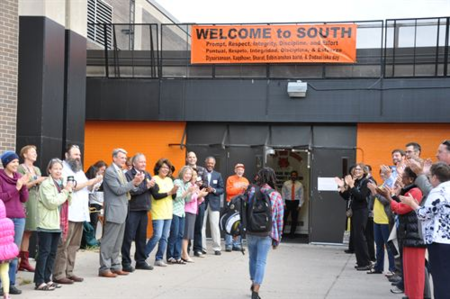 The Corcoran Neighborhood Association (CNO) organized a community welcome for 1800 incoming South High School students on their first day of school. The idea came from Corcoran board member and long-time resident Gerry Tyrrell. Tyrell has two kids who graduated from South High and lives ½ block away from the school. He felt it would be a wonderful positive thing for students coming back to feel that community support. On August 24th, Corcoran staff and board members lined up with City and State elected officials, the Mpls. Fire Chief, local business leaders, and many other leaders to cheer on the arrival of students. The Loring Park neighborhood received an award for Best Downtown Neighborhood from the Downtown Improvement District’s (MDID) 6th Annual Greening and Public Realm Awards. Additionally, the Loring Greenway received the award for Best Large Green Space. The Greening Awards, an MDID initiative since 2010, celebrate outstanding examples of private greening and placemaking happening in Downtown Minneapolis. MDID accepted nominations through an open social media and email submissions campaign throughout July. Submissions were divided into 12 categories based on the nature of the project. Finalist voting began August 10 and concluded August 24. For more information, please visit: http://www.minneapolisdid.com/news_article/show/547620?referrer_id=399053. Renters: what does “home” mean to you? This summer the City of Minneapolis Innovation Team has been busy examining the broad issues of racial and placed-based disparities within Minneapolis, getting to know the City, and digging into its first priority area: reducing racial and placed-based housing disparities in Minneapolis. As part of that effort, the “i-team” wants to hear from people who rent their homes. Minneapolis renters are encouraged to share their thoughts about “home” by tweeting @CityMinneapolis using the #HomeIsThePlace hashtag. Learn how to save money and help the environment. This family-friendly event will feature a variety of presenters highlighting ways to make your home energy efficient with the opportunity to learn more about solar options. The event features free LED light bulbs, free Home Energy Squad visits, a grand prize give-away and a complimentary continental breakfast. The Energy Fair will be held from 9:30 –12:30 at the Minneapolis Convention Center. Mayor Betsy Hodges presented her 2016 recommended budget to the City Council August 12. Council members will consider the budget from now through early December, with final approval of the 2016 budget scheduled forWednesday, December 9, 2015. $13 million in affordable housing, including investments in the Affordable Housing Trust Fund, $1 million flexible dollars to help create affordable housing options for large families, and targeted rental assistance for families leaving shelters. $10 million for the City’s portion of the 10th Avenue bridge rehabilitation project. $400,000 to accelerate Minneapolis’ conversion of City-owned streetlights to LED technology, which will save an estimated $113,400 a year – enough to have the conversion pay for itself in four years. Funding to raise the sworn complement of police officers to 862. Funding for 30 TechHire Initiative scholarships that would provide women and people of color with job training to meet the growing demand for employees with technology skills. Nov. 18 at 6:05 p.m.
1:30 p.m., Sept. 8 – Ways & Means budget overview presentation. 5:05 p.m., Sept. 9 – Board of Estimate and Taxation meeting and public hearing on maximum property tax levies and the mayor’s budget. Sept. 18-Nov. 3 – Ways and Means presentations and consideration of City departmental budgets hearings (tentative dates can be found atwww.minneapolismn.gov/finance/budget). 1-4 p.m., Dec. 4 and 7 – Ways and Means Budget Subcommittee budget markup. 6:05 p.m., Dec. 9 – City Council final vote on budget after the public hearing. You can watch the mayor’s budget address and upcoming budget hearings on Minneapolis 79 (Comcast Cable channel 79) or on a smartphone, tablet or computer by visiting the City of Minneapolis website atwww.minneapolismn.gov/tv/79. Next Post Victory Labor Day Races & Community Picnic – Thank you!